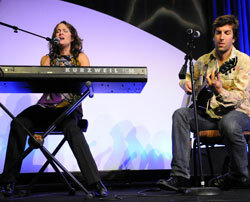 It’s about time to fly home from the National Biodiesel Conference so I thought I’d leave you with some more music from Emily Richards and Jason Brock. This is from their new Brown album which is available via ccMixter. I’ll get a link from them to post for you later. I have a number of items that I’ll post after getting back to the home office. I hope you’re enjoying our online coverage of this year’s conference.